Tim Phizackerley, Founder and Creator of PSTEC; Peter Owen, PSTEC Master Practitioner and Jeff Harding, PSTEC Master Practitioner; recently recorded a discussion to answer questions and offer additional tips to help a certain group of individuals to make their PSTEC work even more effective. That particular group purchased and studied the PSTEC Advanced – Part 2 Package. This recording was a Bonus added to the package after the fact … just more value provided to the users of the PSTEC Advanced – Part 2 package at no extra charge. For those who have not yet studied and implemented the effective strategies from this package, you have the opportunity to listen to the first 30 minutes of the Bonus recording. 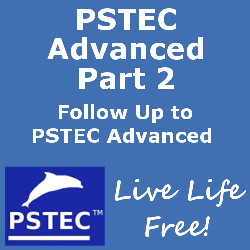 There are some great tips and concepts in this sample portion that you can use whether you study the PSTEC Advanced – Part 2 package or not, but once you listen to this sampler, if you want more, feel free to purchase the Advanced Part 2 Package and get the entire 90 minute Bonus recording in addition to the huge Advanced Part 2 package. Suggestion: If you have not yet studied and used the Level 1 Package and original PSTEC Advanced Package, it is suggested that you study those first. Discover what even advanced PSTEC Practitioners practice and utilize on a regular basis … this is a foundational technique that many people try to skip… don’t skip this if you want quicker and more effective results with PSTEC. Listen in as Tim reveals more of the many features and benefits that he has included in the Click Tracks. When you’re overwhelmed with the negative and don’t know what to do, Peter gives us some suggestions where to get started and what to do. Learn a unique approach to addressing your resistance to using PSTEC so you can more easily transcend your limitations and problems. You will hear about some new suggestions for using PSTEC Positive to help transcend the parts of your mind that sabotage your success. Step-by-Step Guide! Extra Effective Tools! Plus, this package includes PSTEC Positive help you shift out of limiting beliefs and into a world of unlimited possibilities! This technique is incredibly unique and flexible in helping you gently help your clients make some impressive emotional shifts. This package is the follow up to the PSTEC Level-1 Package that showed you that therapy can be easy and powerful all at the same time. But, there’s more! Let Tim show you what you’re missing with the PSTEC Advanced Audio Package and he will show you how to be even more effective.